Solid brass planter with gently hammered antique brass finish lacquered to resist tarnishing. 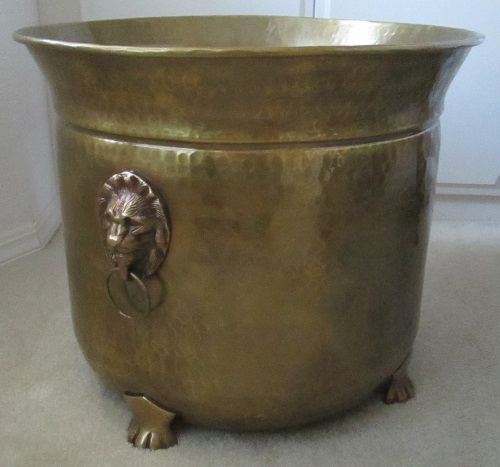 Cast brass lion head handles and cast brass feet. This is a commercial-quality piece for home or office use. Diameter 17.75" (measured across top opening). Inside diameter 15.25" (measured half way down from the top rim). Planter height 14.75" overall including feet. Interior depth 13.75" Only from Excellent Accents Inc. Note: Finish, weight, and dimensions may vary slightly as this piece is hand made.